German Chancellor Angela Merkel on Saturday spoke out against the Trump administration's intentions to drop out of the Paris Agreement on climate change. In the final press conference of the G-20 summit in Hamburg, Germany, Merkel said the decision to leave the climate accord would be "irreversible." "You are familiar with the American position. You know that, unfortunately -- and I deplore this -- the United States of America left the climate agreement, or rather announced their intention to do so," she said on the final day of the summit. 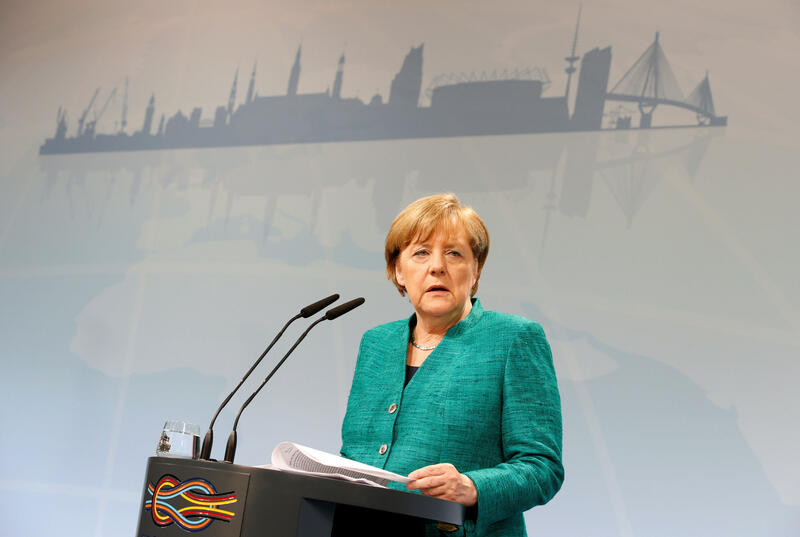 "What becomes clear in this declaration is the dissenting view of the United States, but I am gratified to note the other 19 members of G-20 say the Paris agreement is irreversible," Merkel continued. "We feel committed to what we agreed on and should be implemented as quickly as possible." Merkel added that she did not share the same view of British Prime Minister Theresa May, who said Friday that the U.S. could someday return to the climate accord. In a communique, the G-20 nations noted the U.S. decision to withdraw from the agreement in a section dealing with energy and climate. "The United States of America states it will endeavor to work closely with other countries to help them access and use fossil fuels more cleanly and efficiently," the communique reads. The statement reaffirmed that all 19 nations agreed that the decision to leave the accord would be permanent, and that the U.S. was the only nation that declined to sign the "G20 Hamburg Climate and Energy Action Plan for Growth." Mr. Trump won the 2016 presidential election after campaigning to put "America First" by pulling the country out of the historic Paris Agreement. In June, he announced his intention to work with world leaders on a deal that would be fair for U.S. taxpayers. "In order to fulfill my solemn duty to protect America and its citizens, the United States will withdraw from the Paris climate accord," Mr. Trump said from the White House Rose Garden. "So we're getting out, but we will start to negotiate and we will see if we can make a deal that's fair. And if we can, that's great, and if we can't, that's fine." "I was elected to represent the citizens of Pittsburgh, not Paris," he added.